No News is Good News…Right? Have you ever been in a situation where you have been waiting on some news and haven’t heard anything yet when someone will predictably say: “No news is good news.”? Yes, I think we all have been there at one time or another. I know that I have said it on more than one occasion. But the reality of this phrase is that it gives us a false sense of security and hope. Just because you haven’t heard anything does not mean that the outcome will result in good news, it might turn out to be bad news after all. This morning I was thinking about the Gospel and how it changes people’s lives. Pondering this amazing truth led me to ask the question: “What if we stopped telling people about Jesus?” The fact is that if we stopped telling people about Jesus there would be no news at all. So would “No News is Good News” work apply in this situation? ABSOLUTELY NOT! In this case, No News is Bad News! See the Good News is all about the redemptive work that Jesus Christ did for mankind on the cross. However, if we aren’t telling world, then there is no good news for them. We live in a world that is lost and dying and there is little hope. If we are not telling the world about the hope that is found in Jesus Christ, then they will stay lost and face the bad, no, the horrible news of condemnation of being eternally separated from their Creator! Without the Gospel, there really isn’t anything good about this world. There’s no purpose and there is absolutely no hope. 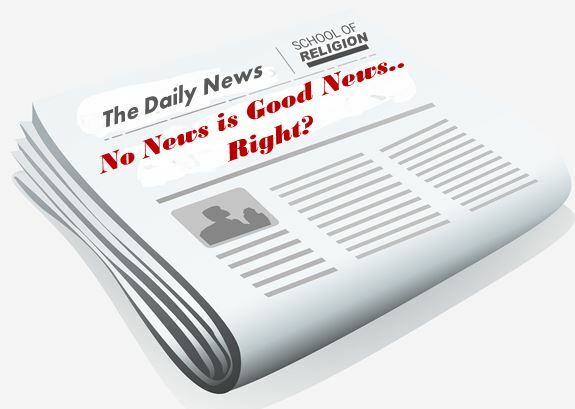 Truth is, without the Gospel “No News is Actually Bad News” for this world. The only way for people to hear the good news is for us, as Christ followers, to actually tell the world about the Good News of Jesus Christ! This is exactly what Jesus Christ told us to do in Mark 16:15: “And then He (He being Jesus) told them, ‘Go into all the world and proclaim the Good News to everyone.’” So I encourage you today to listen to Christ and get out and share the Good News of His redeeming work on the Cross! If you want to know more about the Good News of Jesus Christ, please email me at Jacob@fsbcbearden.com! I would love to share the Good New with you! Intriguing! I agree!! Without the Gospel, what other good news do our people have to look forward to? The News is tampered with, social media misleads, and we’re left what social currency?…….Thank God for the “Good News”!!!!!! YB, you are correct! Today’s news is for the most part unreliable and untrustworthy. However, the Gospel hasn’t changed in over 2000 years! Jacob has a passion to help people come to know Jesus Christ as Savior and help find the purpose that God created them for then live out that purpose. His mission in life can be summed up by three things: Loving God, Loving People, and Serving Both! You will find all kinds of resources that will help you grow in your relationship with Christ. The Struggle is Real… So is the Solution! 3 Keys for Being Successful!